Streamlined Backshop Services is now offering our exclusive Locomotive Lighting Kits for sale. Bring your stable of iron horses, your covered wagons, GeePs, StuDs, Big MACs, and your juice jacks to life with the brilliance and intensity of LED lighting. SBS4DCC has packaged many great light fixture designs with pre-wired micro LEDs to provide hobbyists with great products to upgrade their rosters and take full advantage of the power of DCC. These tiny lights are perfect for use in DCC decoder installations and our N Scale Ditchlights could be the smallest functioning add-on ditchlight available anywhere. The kits ship with a dimming resistor already installed. The brightness an be adjusted to taste by removing or replacing the resistor. Installation is simple. All pre-wired LEDs ship with a resistor and wire lead attached to the magnet wire. This is done for testing more than installation. The resistor can be removed and reattached or left off if your decoder has an on-board resistor already. There are many options available for both N and HO Scale. Also, be sure to check out our LED section for plenty of complimentary LEDs to finish your project. Be sure to see the videos below to see just how cool these light kits really are. 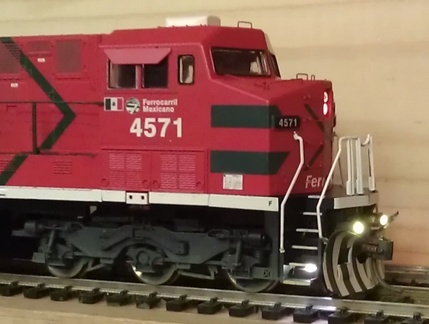 Be sure to visit the store to get your Locomotive Light Kits today!